The Prince of Wales has said “a garden is a reflection of a person’s soul”, and a tour of the gardens he has created at Highgrove, his Georgian family home near Tetbury in the Cotswolds, is certainly revealing. A collection of eclectic, interlinked landscapes ranges from the classic English charm of the Old Cottage Garden to the rich yellow, pink and blue colours – inspired by His Royal Highness’s travels in Tibet – in the New Cottage Garden. Topiary in the Thyme Walk hints at a royal sense of humour; the Wildflower Meadow shows concern for native flora and biodiversity. A labour of love since 1980, the prince’s gardens reflect a creator by turns eccentric and conformist, traditionally English yet culturally open and pioneering – the organic, sustainable management principles he champions, once derided as cranky, have become mainstream aspirations. Whether royal or not, gardens can mirror not only individual souls but also the fashions and feelings of society. And that’s a great invitation to take a tour through 1,000 years of garden developments to find out what they tell us about England’s changing times. For most medieval folk, any ‘garden’ would have been a miniature farmstead like the “yard… enclosed all about / With stickes” of the poor widow in ‘The Nun’s Priest’s Tale’ in Chaucer’s The Canterbury Tales, and throughout the centuries people have continued to tend gardens for food. But at Abbey House Gardens beside the 12th-century Abbey Church in Malmesbury, Wiltshire, another world opens up. Evoking the medieval sanctuary of fish ponds and herbarium once recorded here, it points to a monastic way of life when gardens provided peace for study and contemplation as well as places to keep carp for the table and herbs for medicinal and culinary use. No original medieval gardens survive, but we have clues to the privileged life of medieval royalty in a reconstruction at Queen Eleanor’s Garden beside King Henry III’s Great Hall in Winchester. Sitting amid scented herbs and plants grown in the 13th century, you soon appreciate the attractions of a secluded ‘herber’: the small precinct of a castle where a queen might while away the hours with her ladies. Henry ordered three herbers to be created at Winchester Castle. 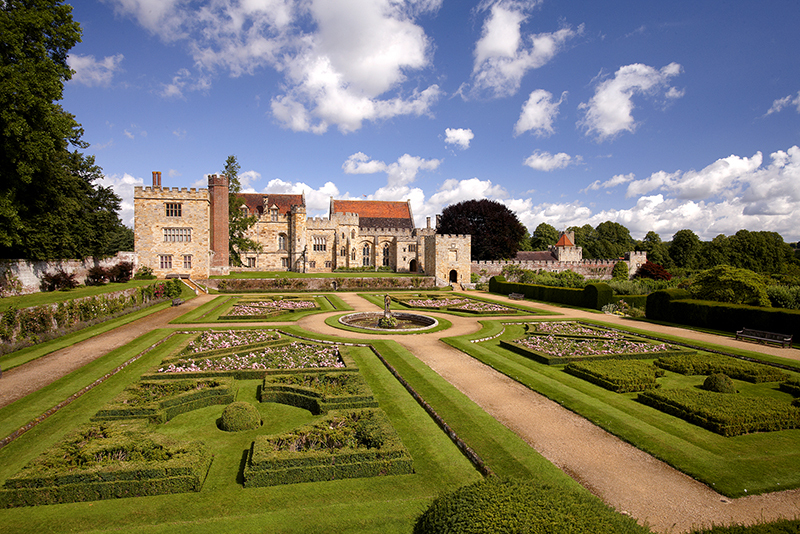 What, then, do the gardens at Penshurst Place in Kent tell us about Tudor aristocratic life? 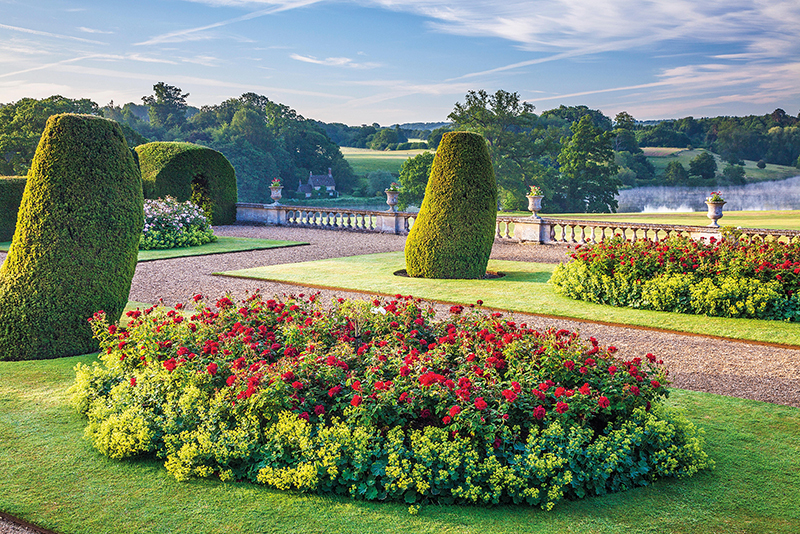 While Ben Jonson lauded Penshurst’s fruit-growing in his poetry, the classical Italian garden created here by Sir Henry Sidney in the 1560s is a decorative showpiece, designed to be viewed from the staterooms above. Tudor movers and shakers had cash to splash and were keen to demonstrate their good taste including the latest Italian Renaissance ideas. Meanwhile, Penshurst’s Heraldic Garden, boasting brightly painted beasts, is a modern homage to an earlier 16th-century garden with ‘knottes’. Low-level mazes or labyrinths in which gentry took exercise became favourite features in Tudor times, as did knot gardens that, demonstrating control and symmetry, took the ‘over and under’ of threads in needlework patterns outdoors. A re-creation at Sudeley Castle in Gloucestershire, made from box hedges interspersed with coloured gravel, is based on a pattern on a dress worn by Queen Elizabeth I in a portrait hanging in the castle. Warwickshire’s Kenilworth Castle gives us the most breathtaking sense of the swaggering Elizabethan age. At a time when courtly competition for royal favour had reached feverish new heights, Robert Dudley, Earl of Leicester, went all out to woo the Virgin Queen with his building and garden-making here. An eyewitness account of Elizabeth’s visit in 1575 waxes lyrical over Dudley’s “goodly garden” with a terrace overlooking a dazzling marble fountain; obelisks and spheres, fine arbours and fair alleys, an aviary, fragrant herbs and flowers “so deliciously variant”. Sadly for Dudley, no amount of scent and beauty persuaded Elizabeth to marry him, but visitors today can enjoy his vision, faithfully reconstructed from historical records and archaeology. No less status-conscious, the elite of the Jacobean court matched their magnificent country houses with magnificent formal gardens. They were influenced by ‘sophisticated’ French tastes and included flower-filled parterres that developed from Tudor knot gardens. There are also quirky clues to economic and political goings-on: a mulberry tree on the corner of the West Garden at the Marquess of Salisbury’s Hatfield House in Hertfordshire, still bearing fruit after 400 years, is a reminder of King James I’s encouragement to grow mulberries in the hope of establishing an English silk industry; efforts failed because black mulberries rather than white – preferred by silkworms – were planted. At Oxfordshire’s Chastleton House and Garden there’s not only a mulberry tree but also a ‘Boscobel Oak’, allegedly grown from an acorn taken from the tree in which King Charles II hid when fleeing Oliver Cromwell’s troops in 1651. Two Scots pines are claimed to be covert symbols of the household’s Jacobite leanings when the Stuart kings were finally ousted from the throne. 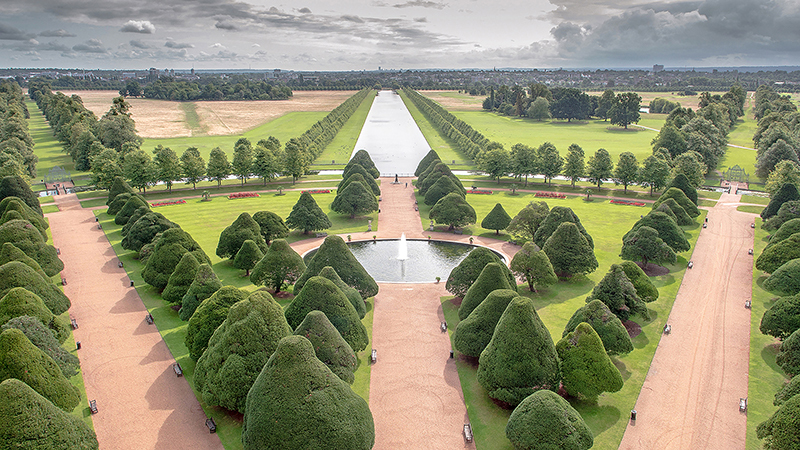 Intimations of regime change after the Glorious Revolution are evident in the Dutch and baroque tastes that King William III and Queen Mary II brought to Hampton Court Palace and its gardens. Precision and geometry were the order of the day: avenues of trees, elaborate parterres and stately walks. The restored Privy Garden is planted in a stunning symmetrical pattern; the puzzle maze with its half-mile of winding paths amid tall hedges presents a humorous challenge today just as it did for the royal court. Over in Gloucestershire, Westbury Court Garden is the ultimate Dutch-style water garden with canals, clipped hedges and ornate buildings, while Levens Hall in Cumbria is the definitive destination for weird and wonderful clipped green topiary within a formal setting. 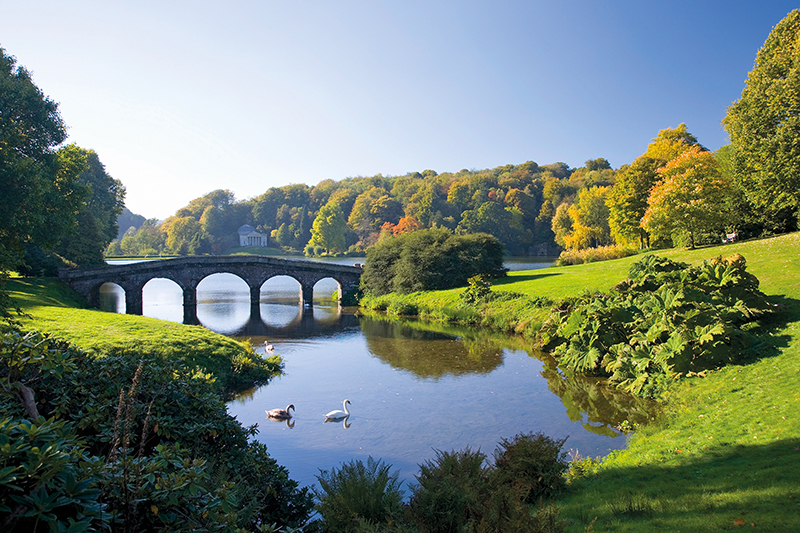 In contrast is Stourhead in Wiltshire, where you feel as if you have walked into a painting by Claude Lorrain, peppered with classical temples and monuments. The epic landscape reflects the character of its creator, Henry Hoare II, and the influences of every Georgian gentleman’s must-do activity: the Grand Tour of Europe, notably Italy. Hoare had the wealth of the family banking business behind him, and in the 18th century individual and national confidence strode hand-in-hand as industry and empire expanded. Writing in 1755 about his achievements at Stourhead, Hoare describes them as “the fruits of industry and application to business… the envy of the indolent, who have no claim to Temples, Grottos, Bridges, Rocks, Exotick Pines [sic] and Ice in Summer”. Charles Bridgeman, William Kent, Humphry Repton and, above all, Lancelot ‘Capability’ Brown (so named for his habit of telling clients their estates had great “capability” for improvement) all developed landscape gardening on an epic scale in the 18th century: obliterating the formal work of earlier generations, moving hills, damming waterways, planting trees by the thousand and displacing villages to make way for idealised ‘naturalistic’ visions of an undulating green and pleasant land glittering with sinuous rivers and serpentine lakes. So very English, it is a country house parkland ‘look’ that has endured to this day at Blenheim Palace, Bowood House and Burghley House. Yet many Victorians, tiring of endless green swathes, hankered after more colour. The Rothschild family – another great banking dynasty – championed a flamboyant style of gardening at Waddesdon Manor in Buckinghamshire, with vivid carpet bedding designs (richly patterned arrangements of low-growing plants) in the parterre. Dramatic rock work, some of it artificial, reflected the Victorian love of invention and ingenuity combined with industrial advance. There’s also colourful carpet bedding and a vast rock garden at Cragside, Northumberland, the home of Victorian inventor Lord Armstrong. While his house was the world’s first to be lit by hydroelectricity, his landscape garden became a place for experimentation with plants, trees and water. From his innovative cast-iron loggia to his pinetum featuring conifers from North America, you get the feeling that Armstrong and his ilk believed anything was possible. That feeling comes alive too when you visit the Palm House at the Royal Botanic Gardens, Kew, in southwest London, a structure built in 1844 on such a scale that the architects borrowed techniques from the shipbuilding industry. The glass-and-iron building (now a laboratory growing plants in a rainforest climate) provided a home for discoveries brought back from the tropics by Victorian explorers, their intrepid plant-hunting adventures in tune with the brave, global outlook of the British Empire at its height. Exotic tree collections such as Westonbirt, The National Arboretum also began to spring up. Jolly exciting as all this progressive, large-scale gardening was, and the thrusting, industrial society it reflected, a backlash was inevitable. Wander the Edwardian formal gardens at Hestercombe in Somerset and everything is brought back to a softer vision, not least via the gentle borders of silver-leaved plants in the Grey Walk. The pioneering plantswoman Gertrude Jekyll and architect Sir Edwin Lutyens collaborated on this and many other gardens, and it comes as no surprise that the pair were inspired by John Ruskin, William Morris and the principles of the Arts & Crafts movement, which prized traditional craftsmanship and the use of vernacular materials over industrialised mass production. The idea of a garden as a series of individually styled ‘outdoor rooms’ took hold, the Arts & Crafts garden at Hidcote in the Cotswolds being a perfect example. 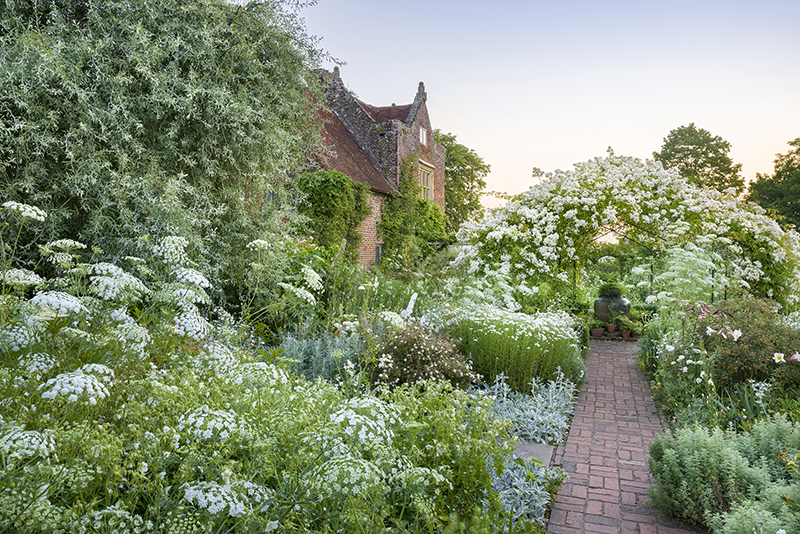 From the 1930s, Vita Sackville-West and her husband Harold Nicolson also created romantic, intimate garden ‘rooms’ around the twin-turreted Elizabethan tower at Sissinghurst Castle in Kent, with ‘hot’ colours in the Cottage Garden and ‘cool’ colours in the White Garden. The style continues to be copied countrywide, as we all seek our private escapes from life’s hurly-burly, with a modern eye, like Prince Charles, to environmentally friendly practices. From utilitarian plots for food to grandiose showpieces of status, pastoral idylls to colourful sanctuaries, a walk in the English garden is an eye-opener on changing times. A visit to the Eden Project, which opened in Cornwall in 2001, leaves no doubt as to our 21st-century eco-preoccupations: not least the giant Rainforest Biome growing more than 1,000 plant species and the Weather Maker treetops journey highlighting the role of rainforests in climate regulation.